Sensory activities are excellent ways for toddlers to explore the world and their bodies. Unsure of what exactly sensory play is? Simply stated, sensory activity includes any open-ended activity that stimulates the senses (touch, taste, smell, hearing, or sight) in a new or different way is a form of sensory play. Almost any activity is sensory, at least in part. That said, as parents and teachers, we can present our children and students with opportunities to experience things they might not encounter otherwise. Here are some ideas for sensory play that will engage and enrich your toddler. Sensory bins are typically low plastic bins either on the ground or tables. The bins contain different materials that allow small children to experience different textures. They also promote experimenting with cause and effect. The wonderful thing about sensory bins is how easy they are to assemble. Most bins can contain supplies you already have in your home. The “bin” can be a large bowl, storage bin, or even a cardboard box you have on hand. Good fillers from your pantry include rice, dry corn, oatmeal, cornmeal, different flours, or dry beans. You can also purchase or collect rocks, sand, shredded paper, or Easter grass for sensory play. A bin filled with water is always a favorite! Include your favorite toy animals, vehicles, utensils, or other engaging toys, and let your children create and discover! Sensory bottles are a great way to engage in sensory play without the mess that may come with other methods. Because you can fill sensory bottles with a wide range of materials, they can teach a variety of concepts and are great for kids of all ages. Playing with a sensory bottle is also a wonderful way to help an anxious child calm down. Making a sensory bottle is simple. Just wash a plastic bottle, remove the label, and fill it with whatever you’d like! You can keep your bottle dry, filling it with rice, buttons, beads, and other small trinkets, or you can use a combination of water, glue, and glitter to allow your little additions to float around. Either way, this activity is portable and a big favorite. Playdough is famous for its popularity with children. Little hands can knead, mold, roll, and squish the dough into countless shapes and creations. Expanding on the same idea, many other forms of semi-solid materials are now available to purchase or make at home. The ingredients for cloud dough consist of baby oil and flour. This sensory item is soft and pliable. You can make slime or goops from materials like liquid starch and cornstarch mixed with water. 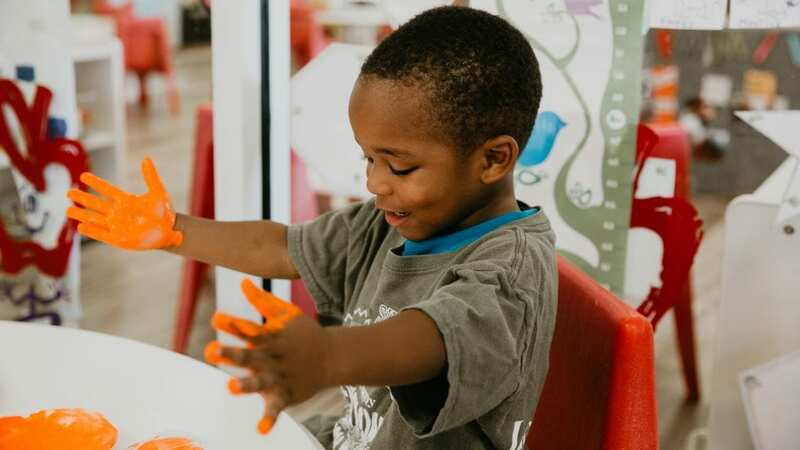 Whether you pick up clay or playdough at the store or choose to make your own substance at home, this sort of sensory play is a great way to practice motor skills and develop muscles. While you can plan and orchestrate engaging and educational sensory play for your child, it is also worthwhile to prioritize sensory-rich natural experiences. A walk in the rain, cooking by your side, gardening, swinging at the park, swimming, and just playing in nature are all brain-building and valuable to childhood development. Don’t forget to allow space for discovery and organic learning to blossom, especially outdoors. These are just a few of the amazing sensory play opportunities you can share with your toddler. Sensory bins, bottles, and doughs will not only keep your little one occupied for hours. They will help your children to make connections and expand their view of the world. Time outside, exploring and having adventures, will do the same. To read more about how Legacy Academy integrates sensory play into our classrooms, read here.